If you’ve ever seen a Kana chart, then you’ve seen the Gojuuon, of the 50 sounds. This in itself gives us a really great starting point to finding the answer. From here, we can guess that there have to be at least 5 vowels and 9 consonants, assuming that the solo ん and な,に,ぬ,ね, and の use the same /n/. We also know that Japanese voices various columns, through the dakuten, those being the ゛marks you see after a kana. With the dakuten, you get voiced /k/ /s/ and /t/; and you also get a voiced bilabial plosive of /p/, which is what /h/ was once upon a time. So we have /g/ /z/ /d/ and /b/. And we also have the handakuten, which is the ゜you sometimes see after the kana starting with /h/, which make /h/ into /p/. We also have the phenomenon of palatalization, which is represented by the ゃゅょ you can see after き,ぎ, し, じ, ち, に, ひ, び, ぴand み, effectively making digraphs. For the sake of simplification and, we will call these digraphs /ky/ /gy/ /sy/ /zy/ /ty/ /ny/ /hy/ /by/ /py/ and /my/. This does not correspond with the romanization system we use, but that’s okay. When we’re just transliterating, we’re not terribly concerned about phonemes as such. Now let’s figure out the phones. In a perfect world, one would have one phone for one phoneme. But that’s really never the case. Fair warning, phonetics is a hotly debated topic, so if you talk to 5 different people, you’ll get 5 different answers. The crossed out phonemes are the ones that we won’t worry much about because they do not have allophones. Allophones are two phones that correspond to the same phoneme under different distributions. You’ll see what I mean in a minute. Distribution refers to the surroundings of a phone, i.e. what comes before and after it. Depending on it’s distribution, the sound a phoneme is will change. For example, take the words “house” and “Hugh.” Notice how the /h/ changes from an open sound to a constrained sound. The sound changes because of what’s coming in front of it, it’s distribution. In Japanese, the most important factor in phoneme distribution is what comes after it, meaning, in most cases, what vowel comes after the consonant. There are three instances where what comes before the phoneme is important: /g/, and /u/ and /n/. The easiest case to talk about is /u/, because everyone becomes savvy to this very quickly. Let’s take two anime names: “Uzumaki” and “Sasuke.” Note that those two middle /u/’s are pronounced different. In the first case, it’s pronounced; and in the second it isn’t. When /u/ is between two voiceless consonants, it is silent. Let’s look at once more case, that of verbs: “desu,” “kimasu,” “korosu.” Here /u/ is also silent. But if you look at verbs such as “kiku” and “naku,” the /u/ is pronounced. In final position, if preceded by /s/, /u/ is silent. [ŋ] is the same sound that Spanish’s “ñ” represents. It’s the same /n/ in sing. You’d be surprised by how difficult it is to pin down when this phenomenon happens. It has probably changed a lot in the past 50 years. We have heard from people who learned Japanese 30 years ago that it’s supposed to be a posh feminine thing, but we’ve heard audio of men doing it all the time. Just keep in mind that it does happen. There seems to be some consensus that the /n/’s in な, に, ぬ, ね, and の are all the same. It’s the alveolar nasal [n]. The most famous case of this kind of assimilation happening is with the word 先輩 (せんぱい/senpai), where it is pronounced with an [m], “sempai.” [m] is the bilabial nasal, and [p] is a bilabial plosive. The same thing happens with velar consonants [k] and [g]. 産休 (さんきゅう/sankyuu) will be pronounced as our friend [ŋ]. In cases where it is at the end of the sentence, it will be pronounced as the uvular nasal [ɴ]. When /n/ precedes a bilabial consonant, it is [m]. When /n/ precedes a velar consonant, it is [ŋ]. When /n/ is in final position, it is [ɴ]. In all other cases, /n/ is [n]. /r/ is another famous case. This is a case of two allophones having “equal distribution,” i.e. you can exchange one for another and you’ll never really have a problem. /r/ is both a flap and a lateral. To put it colloquially, you can pronounce either as an r or as an l. Some people have developed rationales for when a consonant is pronounced either as an the flap [ɾ] or as the lateral [l], but there is a lot of inconsistency between them. There exist a couple of variations with /h/ (and aspirations with certain plosives), but the one case we need to talk about is when /h/ precedes /u/. The tendency is to place /h/ generally in the glottal area, so the glottal fricative [h]. Before /u/, /h/ can be pronounced as a bilabial fricative [ɸ], the labiodental fricative [f], or the glottal fricative [h]. The standard pronunciation, to our understanding, is [ɸ], but the others are heard. /w/ is a dying phoneme. There originally existed four Kana for it (which can still be heard in the Iroha poem): わ, ゐ (wi), ゑ (we), and を. Now only two are in use: わ and を; and を is dying out. If it were not for its functional use, for clearly marking the accusative case particle, it would be gone as well. We bring up /w/ because there are those who pronounce the /w/ before /o/ and those who don’t. Both seem to be fine, though some may claim that this is an abnormality known as hypercorrection, where a sound is produced unnaturally for the same of some kind of regularity (this is common in cases of assimilation, such as pronouncing the final /s/ in “rings” as an [s] and not as a [z]). Regardless, there is an older generation that did learn to pronounce を with the /w/. When /w/ precedes /o/, it can either be silent or pronounced. These four consonants undergo a similar transformation before /i/. The consensus is that they become post-alveolar affricates. It’s worth noting here that the palatal phonemes that /ty/, /gy/, /sy/, and /zy/ have these very same phones. Then, in the case of /t/ and /d/, when they precede /u/, they become affricates, but alveolar and not post-alveolar, so [t͡s] [d͡z]. And that, friends, covers most of everything. There are some things involving loanwords and nuances, such as /s/ remaining [s] before /i/ and there being a [v] and not just a [b], but that’s secondary to all this. 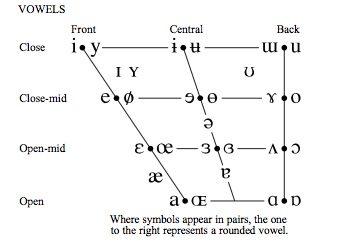 Phonemes, Phonetics, and the IPA chart. Those of us who grew up speaking a language that uses an alphabet are taught to think of language being made up of “letters” and that “letters,” depending on where they are, sound different. Let’s consider the letter /p/. In the first case we have an initial /p/ that comes along with some air. Say the word with your hand in front of your mouth and you’ll feel that hair. In the second case we have a final position /p/ which really isn’t a lot like the first /p/ but more like a closing of the mouth. In the third case, we have a /p/ like the first one sans the air. Here we see the divide between phonetics and phonemics. Phonemics concerns itself with groups of sounds that languages treat as the same and with their pronunciation as different depending on where it is in a word. Those different sounds are the concern of phonetics. How do we find a phoneme? We find phonemes through “minimal pairs.” A minimal pair is a set of two words that are exactly the same except in one sound. If that difference changes the meaning of the word, then we have a new phoneme. They’re exactly the same except in one sound, that initial nasal consonant, and they mean two very different things. Going back to the /p/ example, take the first and third variations of /p/ and say the word “potato.” Think of the way the Minions from the Despicable Memovies say the word “potato,” if you can’t imagine the word with the 3rd variation. Question: Does that change the meaning of the word? It doesn’t; and that’s a very good indication that these two phones, or sounds, are parts of the same phoneme. Phonemes are the easy part, most of the time. The hard part are the phones. Linguists have their own alphabet to describe sounds, commonly referred to as the IPA Chart. The identified vowels are 28 and are distributed according to where and how they are produced. “Closed” and “Open” refer to how open or closed the mouth is. That [i] you see on the top left is the /e/ in “me.” That [a] you see at the bottom left is the Bostonian /a/, as in “car.” “Front” and “Back” refer to the place of elocution. That [u] in in the top right is the /ou/ in “Lou.” Try it out! The consonants are many more, about 60. As the notice says at the bottom, the consonants on the left side of each cell are voiced; an the ones are the right are voiceless (or unvoiced). [d] and [t] are the same sound save that one requires the use of one’s vocal cords and the other doesn’t. Give it a shot! Moving left to right, you make a similar journey as you do with the vowels, starting with consonants made at one’s lips all the way to the glottis. Moving up and down, you get different kind of consonants. “Plosives” are sounds made with a single movement, sounds you can’t sustain. Nasals are sounds made with vibrations in the nose. Trills continuous repetitions of one sounds. Taps are like trills except they happen only once. Fricatives are sounds you can sustain. Lateral Fricatives are sounds made by sending air through the sides of the mouth, determining the flow with one’s tongue. Approximants are hard to describe, but it’s good to think of them as continuous sounds that are like nasals but occur in the mouth and not in the nose. Lateral approximants are approximants that occur at the sides of the mouth. Here are some examples that might help! The fricative [ɸ] is one of the ways you can pronounce ふ /fu/ in Japanese. The nasal [ɲ] is what in Spanish is written as /ñ/. This is a great site where you can listen to the phones in different parts of a syllable. This is a chart where you can see and download the chart itself, including the digraphs and annotations that we didn’t cover here. We’ve talked about a lot! Now that we understand parts of speech, we can talk about Syntax, and after this you’ll have a very good grasp of what goes on in Japanese sentences. Syntax refers to the way that the ordering and grouping of words and phrases in specific orders conveys specific meanings. Syntax wonders why “John ate the apple.” and “The apple ate John.” are very different sentences. 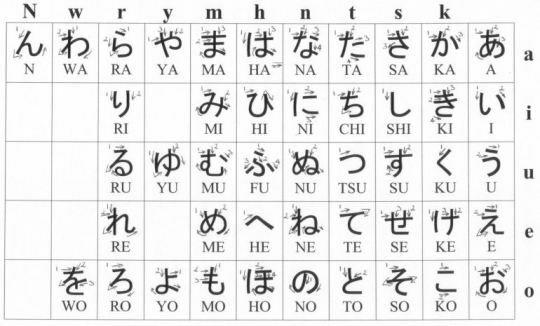 Japanese is what linguists call a synthetic language, meaning that one has a fair amount of flexibility with how the phrases are ordered while preserving meaning. This is possible because our particles tell us the function of the phrase and not the phrase’s place in the sentence (as is the case in English.) It’s not the most synthetic language out there, and there are structure rules, but it’s something to be aware of. What we will provide here is the core of syntax: the relationship between the arguments, the adverbs, and the verb. We will write more on syntax in the future. Let’s start out with a guide of the different kinds of phrases and what they’re made up of. Everything optional is in green. So here are some important things to note. The only thing necessary in an inflexional phrase is a verb. An inflexional phrase is essentially a sentence, or at least a complete idea. In a verb phrase, the noun phrases we’ll call arguments: the subject and the direct and indirect objects. Verb phrases that precede nouns are modifying the noun. In this way of seeing things, we do not easily account for quotations; but quotations are a kind of adverb that is restricted in its positioning. Interjections are IPs in themselves. They do not really exist as part of another sentence. A Japanese sentence ends with a verb, aside from the ending particles, and any phrase coming after the final finite verb is called a displacement, which means that its position is irregular. The head of a phrase is the part of speech that corresponds to the phrase; and it is always at the end of the phrase. So let’s look at a sentence! This is a weird sentence, but it is a sentence. The conjunctions stem from the function of the gerunds (Te-forms) “tabete” and “nonde.” That’s okay. That would be [Okaasan wa] in the first IP; and there is no other. And that in a tree will look like this! I hope all this has been helpful. We do explain things over and over again in our lessons, so don’t feel as if you have to memorize all this. We’re not here to test you, we’re here to help you. This is not the definitive guide to Japanese by any stretch of the imagination; but it should be enough to get you going. Those who have followed our work will know that we do not believe that the things Japanese calls adjectives are actually syntactically adjectives. That’s just to say that one can explain Japanese just fine without having to call the vast majority of adjectives, well, adjectives. That makes this following part extra complicated; but bear with us. The following will be the most complex part of this Starter Kit. It may be easier to learn about it the conventional way (through textbooks and the like) before listening to us talk about it. But, here it goes. We should also note that this is a controversial topic; and, like before, we do not have the last say on the matter. We hope that our ideas on this matter, as with many others, will mature over time. While Japanese’s nouns don’t change a lot, its verbs make up for it in spades. You’ll remember that we called the changes nouns go through declension. The equivalent phenomenon in verbs is called conjugation. The general term for both phenomena is inflection. Japanese verbs conjugate for two voices, two tenses, two poles, and three moods. That sounds like a lot, but we’ll get through it. Verbal Stems are the verb without any verbal suffixes that make it conjugate. To find the verbal stem, one just removes all the suffixes. If one looks it up in the dictionary, one will find the indicative, positive, active, present/future conjugation of the verb. To that, one just has to take off the final /u/ or /ru/ and one will have the verb stem. That’s the stem in the underlying form. The underlying form is a level in morphology that exists before the word is said or written. It is similar to how things are 0’s and 1’s in a computer under they appear on the screen. The opposite is the surface form, which is how they appear in elocution. The verbal stem is seen in use as a participle, meaning that it modifies a variety of things with its verbal meaning. They’re very frequent; and in our parsings we run into tons of them. The constructions of our verbs will be based on the underlying form of the verbal stem. Mood is a linguistic term to describe how some verb’s actions do not take place in reality, but as possibilities, thought experiments, logical processes, etc. For example: “I eat an apple.” vs vs. “I can eat an apple.” vs. “I made him eat an apple.” These are all slightly different and in Japanese involve different moods. Indicative– indicating that something is happening in reality. Potential– indicating that something can happen. Causative-indicating that something is made to do something. The indicative is the easiest to understand, and lucky its suffix is a zero suffix, meaning that it involves no additional suffix. Hold onto your hats. Things are going to get crazy. The suffix in the underlying form is -βαβe. And before you tell us to go to hell, hear us out! β is going to be our stand-in letter meaning that it is an extremely weak consonant that, if it does make it to the surface form, will be /r/. α is our stand-in for a weak vowel that, if it does make it to the surface form, will be /a/. Both β and α it to the surface form IF what precedes is ε and only ε. So it’s an all or nothing deal with the stand-ins. Oh, and by the way, that last /e/ in the suffix is a ε. I just didn’t want you to freak out too much. The suffix of the causative is -σasε. Similar story as before. σ is a stand-in for a letter that, if it makes it to the surface form, it is an /s/. Here’s the rule: δ makes it to the surface form ONLY IF it is preceded by ε. It’s the same rule as before. The active voice has a zero suffix. The suffix is -βarε. We know the rules for β. Let’s see them in action! Japanese has two tenses and a periphrastic tense that gives the tense aspect. Tense refers to the time in which something happened. Japanese has two tenses: imperfective and perfect. The imperfective tense, or the present/future tense as many call it, indicates that the action happens now or will happen in the future. The perfect tense indicates that something happened in the past, and is not the case now. We’ll talk about the periphrastic progressive aspect later. The truth of the matter is that Tense and Polarity work together. It is very difficult to talk about one without the other, given that the affirmative has a zero suffix and the negative suffix has its own present tense suffix. So we will look at them together. 1. The suffix for the affirmative, imperfective is -βu. It works beautifully for the potential and causative moods. It is always -ru is the surface form. With the indicative, you are back to deciding on whether or not the conditions are met for β to make it to the surface form. But if it doesn’t then it’s just an -u. A) If the word its attaching itself to ends in β, then it turns itself into /t/. B) If the word its attaching itself to ends in a vowel or /ts/, then it turns itself and the /ts/ (if present) into /tt/. C) If the word its attaching itself to ends in a /k/, then it turns itself and /k/ into an /it/. D) If the word its attaching itself to ends in a /d/, then it turns itself and /k/ into an /id/. The rule for κ is the opposite of α, in that it disappears then ε precedes it and in no other case; and also, it’s surface form is /a/. ω is a bigger big bad wolf. When it it is in final position, it makes it to the surface as /i/. 4. The suffix of the negative, perfect is -ζα applied to ω. And that finishes things off with verbs! The gerund is like the participle in that it’s a non-verb with verbal qualities. In Japanese, what the Te-form does is make a verb atemporal and makes it either adjectival or nominal (a noun). Progress is an aspect. Aspect is a linguistic term referring to the time in which an action takes place. Japanese verbs normally have simple aspect, which means that one can assume that they will happen an unspecified amount of time. “John eats one apple.” can mean that John eats an apple once or that maybe he eats an apple as a habit. Progressive aspect refers to the action still taking place. “John is eating an apple.” and “John was eating an apple.” reflect progressive aspect. “Iru” is a copula, meaning “to be” or “to have.” This is now your main verb. (Grammar calls it an auxiliary verb, but really it is now the verb that will go through any necessary conjugations). So conjugate “iru” as you need it, and you have progressive aspect. The stem of “iru” is /iε/, in a case where ε does not surface. There are a series of suffixes we shall know as first order suffixes, which means that they occur at the same level as tense and as such go where -βu would go if it were an affirmative, present sentence. The volitional indicates an encouragement to do something. “Let’s eat an apple!” The suffix if is -υou. The rule is the same as β and σ: Only if it is preceded by γ will it make it to the surface. And if it makes it to the surface, it is /y/. The nice thing about the imperative is that once you’ve attached its suffix it’s a fully functioning verb, nothing else needed. The imperative indicates an order. “Eat an apple!” The suffix is -βe. The rule is the same as β and σ and υ. We can call these “weak consonants,” if we want to, since they follow the same rule. The polite suffix is something that is harder to pin down in terms of function than one would think. Yes, it makes the verb polite. But when one uses it is on the practical level depends on the person. The way the textbooks teach it is that one uses it only in the main verb, but in day to day speech one finds it elsewhere as a sub-standard form of hyper-politeness. The suffix is -ιmas, with the ι being a vowel that drops out when it precedes γ and in the surface form is /i/. Then one adds the tense and pole suffixes -βu and -ζa for the affirmative. For the negative, it has some “special suffixes,” which are Western regional things that creeped their way into standard Japanese. The negative perfect is a periphrastic construction, meaning that it depends on another verb to get to that meaning. The verb is the polite, negative, perfect of the copula “da,” which is a truncation of a historical form of the verb (de aru ー＞ de arimashita). Is a series of suffixes that go after a certain tense and pole. So they are the last thing one needs to add in a conjugation. This is the conditional focusing on the result. The suffix is -ra. This attaches to the affirmative, perfect tense. This indicates that does not intend to do something. The suffix is -mai. This attaches to the affirmative, imperfective. This indicates that one orders another to not do something. The suffix is -na. This attaches to the affirmative, present. There is one mood we did not talk about; because we are unsure if it is a mood; it is the desiderative, which expresses a desire. The suffix is -ιtaω. It attached to the verbal stem without any real problems. Then the ω conjugates as needed. Now that we’ve talked about ω, talking about adjectives becomes much easier. ω is what we call a copula. It’s a verb that tells us whether something is or isn’t, was or wasn’t something. They tend to lack some or all other moods. Conventional Japanese Grammar talks about i-adjectives and na-adjectives. It will admit that na-adjectives are nouns with a verbal suffix when in attributive position (“na” for the present affirmative.) It will hold, however, that i-adjectives are true adjectives, however. We say nay. Why? Because the /i/ in i-adjectives are ω; and we know that ω is verbal. It conjugates for the tenses and poles, and for the gerund. So let’s look at that. All this data indicates that ω is something like /kuξ/, ξ is something that, if left alone, turns everything into /i/ and if paired with ζ somehow turns everything into /katta/. These are things to do research on. So i-adjectives are verbs. The only thing is that semantically they are adjectival; but that is not so strange. The adjectives that do exist are created over time through shorthands or historical variants on old lexemes. Even then, we have reservations about some of these; and we’ve written about this before. This is one of specialty topics, so expect to hear from us a lot about this. Okay, enough with the parts of speech. Next time: Syntax! And after that, we’re done! !